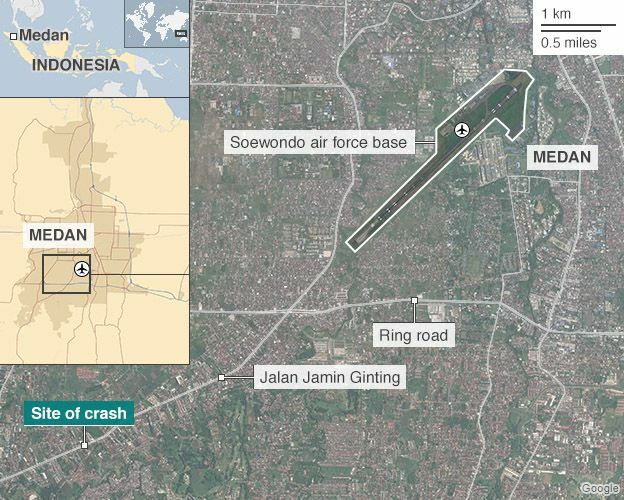 Indonesian officials say 141 bodies have been recovered after a military transport plane crashed in a residential area of Medan on Tuesday. The military says none of the 122 people on board the Hercules C-130 survived when it hit houses and a hotel before bursting into flames. Many of the victims are thought to have been relatives of servicemen and women. But the latest death toll indicates there were at least 19 people killed on the ground. The military has repeatedly revised the passenger list, a sign of how loosely it keeps track of who gets on its planes, correspondents say. 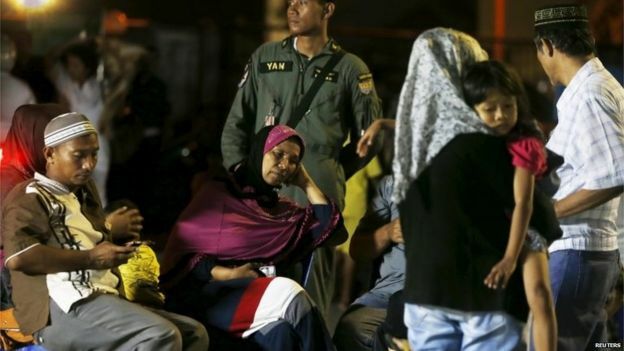 Alice Budisatrijo, BBC News, Jakarta: Why were there so many civilians on board? The Indonesian military allows relatives of servicemen and women to hitch a ride on military aircraft. The definition of relatives could be quite loose - they often include people outside the immediate family. But the Hercules crash in Medan may have exposed a long-running operation in military air bases in Indonesia's remote areas. People living in places like Natuna islands, where the plane was supposed to go later, are fully aware that flying with the military is a cheaper and sometimes more convenient option when they need to get somewhere. The military denies that it is a common practice and vows to hunt down any rogue elements within the ranks who may have been involved. Police official Agustinus Tarigan told reporters at a Medan hospital on Wednesday morning that 141 bodies had been received. 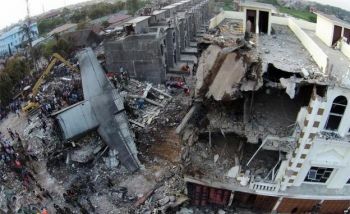 One official told the Jakarta Globe newspaper that some of the victims were having to be identified by blood samples. The cause of the crash is not yet known, but witnesses said the plane appeared to run into trouble shortly after taking off from Medan - Indonesia's third largest city - for Tanjung Pinang, an island off Sumatra. "It passed overhead a few times, really low," a witness named Elfrida Efi told the Reuters news agency. "There was fire and black smoke. The third time it came by it crashed into the roof of the hotel and exploded straight away." Air Force head Agus Supriatna said on Tuesday that the pilot had asked to return to base because of technical difficulties. "The plane crashed while it was turning right to return to the airport,'' he said. President Joko Widodo used Twitter to send his condolences to the families, wishing them "patience and strength". He also said he had ordered the military to carry out a "fundamental overhaul of the management of military weaponry". This is the fourth crash involving the military in three years, says our correspondent, and many Indonesians are demanding an upgrade of its mostly outdated defence equipment. 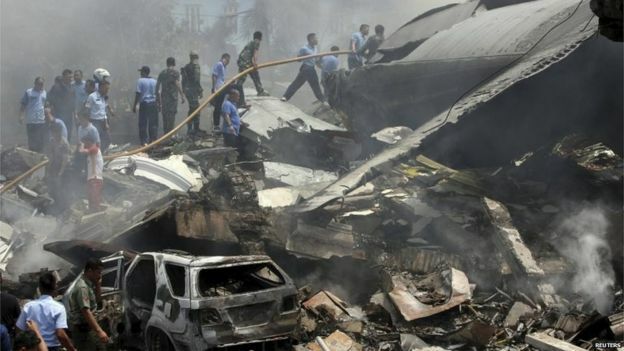 It is also the second time in 10 years that a plane has crashed in Medan. In September 2005, a Boeing 737 came down in a crowded residential area shortly after take-off from Medan's Polonia airport, killing 143 people including 30 on the ground.